I adore cookbooks and have a particular affinity for vintage editions. I love the insight that you get into a time and place from its recipes, the similarities and differences between now and then, the foods and ingredients that were in vogue. 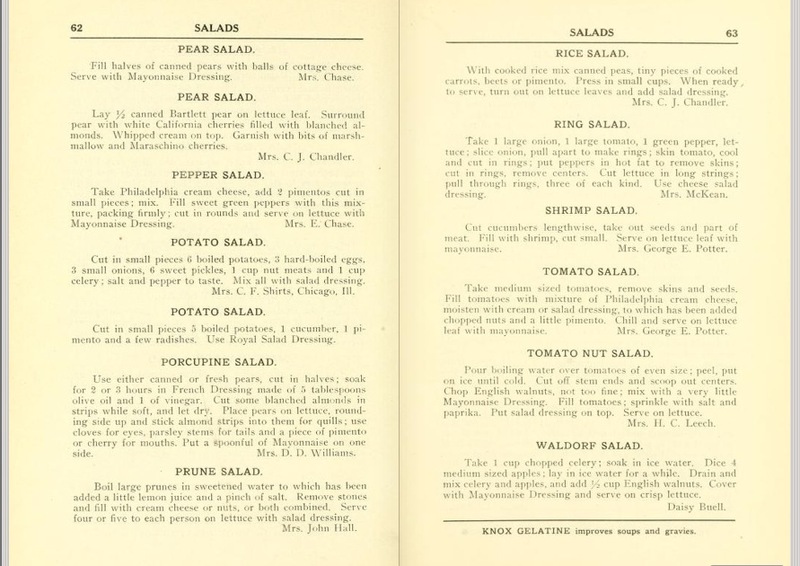 I recently discovered an absolute treasure trove: the Library of Congress digital collection of American Church, Club and Community Cookbooks from the late 19th and early 20th century. Dozens of cookbooks from organizations around the country are available in full and online for your reading pleasure – you can even download them for free onto your tablet! 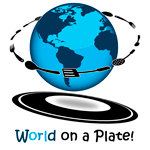 The theme for this month’s World on a Plate event was originally rice salads, then was expanded to include pasta and grain salads. Since I’m the US representative, I wanted to dig into my newfound archives and find a truly American recipe to bring to the table. I went through every single cookbook in this particular collection and was surprised to find only two rice salad recipes, one from 1921 and the other from 1922. They are very simple, and call for mixing vegetables with rice and topping them with salad dressing (mayonnaise-based dressings were the most popular at that time). While the recipe in the Shorewood cookbook (compiled by the Ladies’ Aid Society of the Luther Memorial Chapel, East Milwaukee, 1922) was slightly more interesting for its inclusion of watercress and olives, I opted for the simpler recipe from the Brewster Book of Recipes (by the Woman’s Association of Brewster Congregational Church and their Friends, Detroit, 1921). This recipe couldn’t be simpler, and is in essence rice with peas and carrots. But I like the idea of serving it with a dressing, as well as presenting a mound of it on a lettuce leaf. It definitely has an old-fashioned feel to it, which also makes it comforting in its simplicity. There’s not much not to like about rice, peas, and carrots, and this simple dish – with or without salad dressing – would make a wonderful side for any meal. If you have trouble making perfect rice, read my instructions carefully – I swear it comes out just right every time! 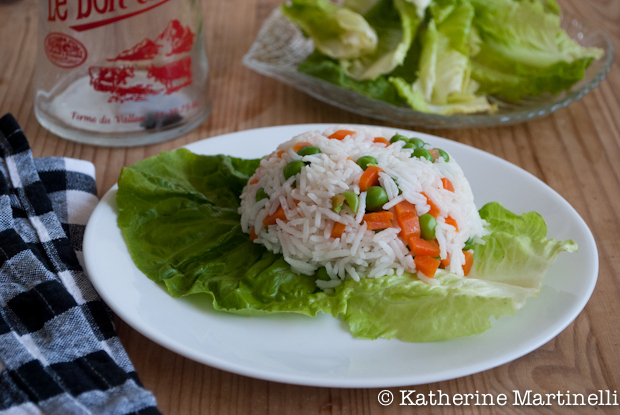 This simple rice salad is pure Americana, and makes a wonderful side for just about any meal. Put the rice and water in a small pot and add the butter, if using (omit to make vegan and parve - I include it to add flavor and prevent it from sticking to the pot). Turn the heat to medium and bring the water to a simmer. Lower the heat and cover the pot. Cook until the water is absorbed and the rice is tender, about 15 minutes. Remove from the heat and keep it covered for at least 5 minutes. Remove the lid and fluff with a fork. Turn out into a large bowl to cool. Meanwhile, bring another pot of water to a boil and add the carrots and peas. Cook for about 5 to 7 minutes, or until just tender. Drain and run cold water over so they keep their vibrant color. Mix the rice with the peas and carrots in a large bowl. Season with salt and pepper. You can choose to mix in salad dressing to taste at this point or drizzle over once it has been served. To serve, Place a lettuce leaf on each salad plate. Tightly pack rice and vegetable mixture into a small bowl. Turn the bowl upside down on the lettuce leaf so it forms a small mound. Drizzle with salad dressing, if you haven't already, and serve. Rice salad is best enjoyed the same day and should not be refrigerated (although the dressing helps to keep it moist). If you have leftovers, make fried rice with it the next day. Oh, thanks for the info about the cookbooks available online. They remind me of my Dutch family’s cookbook. Love your salad presentation! That cookbook link is a dream come true, thanks so much for sharing it with us. Love this rice salad. It’s so pretty on the plate. Wow I have to check out those books! And that salad too! How interesting! I’ve never had rice in salad. I think Japanese cuisine has no rice in salad. I think? What a cool cookbook! Katherine, you are the queen od bloghops and you do it so gracefully. My intentions are always to participate but before I know it you are on to the next one. Love the vintage book shot. Gorgeous! Wow, thanks for that link! Terrific resource. Have to admit that rice salads never have been my favorite, though the one you’ve presented looks so great I may have to change my mind. Good stuff, as always – thanks. Have been a cookery book addict for more decades than I want to admit to. Also love the look and the feel of some of the old ones! Nice to ‘revisit with them’ 🙂 ! Love rice salads too – make a simple one very similar to this! Need to go check out the link for those cookbooks. Just came from Maureen’s site and I love this theme of the old recipes! My mother use to make a rice dish very similar to this and put Ranch dressing on it. 🙂 Thanks for the memories! I’ve never heard of Rice Salad like this I must confess, but I’m willing to give just about anything I try! Simple & delicious! And thanks for the tip w/ the Library of Congress – I had no idea! Very interesting info Katherine. The salad looks very refreshing! I just love retro cookbooks, they hold such gems! I am going to try your rice cooking method as I struggle without my rice cooker!